I’m gushing a little at how bright and colorful this dish is. In the dead of winter, all I want is comfort food, but that doesn’t mean I want to eat colorless mush for 4-5 months. I want to be comforted both by the vibrancy and flavor of my food, as much as the “I-can’t-wait-to-get-cozy-and-tuck into-this-dish” feeling. It’s my second night in the new apartment, and I was so excited to cook up a yummy meal after work. I gladly tackled pickling and canning for the first time this year. After devouring the last of my pickled cherry tomatoes recently – a batch I’ll have to double this summer, for sure – I knew it was time to put the dilly beans to good use. The cherry tomatoes were just so versatile, with the perfect balance of sweet and OOMPH. My absolute favorite dish with them was roasted swordfish with confit pickled cherry tomatoes, and parsnip soup with pickled cherry tomato butter, for Christmas dinner. I fell so hard for those tart, sweet little fruits, I didn’t know what hit me when they were gone. I just had to have that dish again. Alas, that was impossible, so here I am with another seafood dish to satisfy my pickle obsession. And it worked. You can find pickled green beans at a lot of local farm markets or specialty stores…or wait until the summer to make your own, but that’s so very far away. This “recipe” is going to just offer a gist of what I did, since I didn’t really time or measure anything. I briefly, maybe 15 minutes, marinated a half pound of cod in the pickling liquid from one jar of dilly beans. Don’t marinade it for too much longer than that; the acidity will “cook” the fish. Melted a good slab of duck fat in a cast iron pan on the stove, added the pickling liquid without the fish to let them heat together, then gently added the fish to the pan. Cooked for a bit on that side, and very gently flipped it. I only did this because the fish wasn’t completely covered by the liquid, but if it was, I wouldn’t flip it. Not worth the risk of it flaking apart in that case. Once the fish seems just about ready – but it’s clear that a few more minutes are needed (i.e. the flesh is just a smidge translucent still), pop the pan into the oven to finish it up. I typically like to use the broiler for this, to give it a nice depth of flavor, but the oven at 350 worked out great as well. 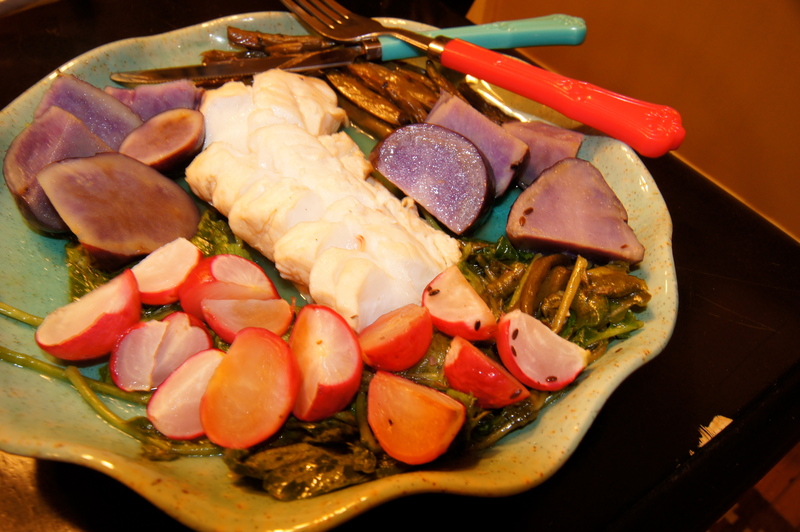 Cooked the scrubbed, sliced blue potatoes in boiling water, then finished them in the oven at 350 for a few minutes. Roast quartered radishes (1 bunch) in a couple spoonfuls of the dilly bean liquid/duck fat combination from the cast iron pan. Dilly beans roasted in their mighty juices until satisfyingly roasted. Let ’em mingle with the radishes and potatoes…they seem to get along swimmingly. 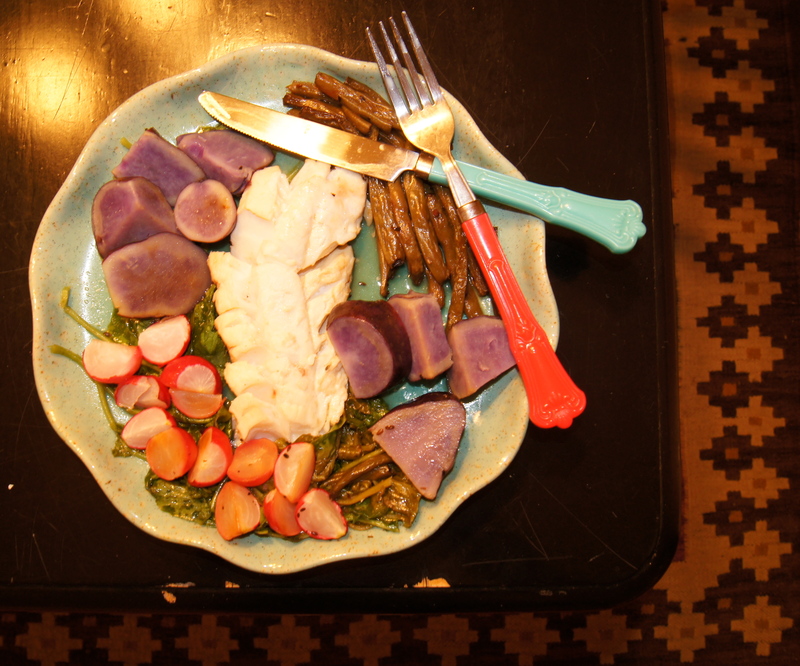 When the fish was done cooking and removed from the heat, I added a bunch of radish greens to the pan, which lovingly melted under the adoration of the dilly bean & duck fat marinade. I added the tender greens in two batches, gently letting them ease into the flavor. What’s your favorite use of pickled veggies? This looks like a great meal! I love dilly beans, I topically pair them with a burger instead of fries. I have never had roasted radishes before, but will definitely try it! Thanks Haley! Love dilly beans. Am kind of up to my ears in them!